There is a lot of talk about natural flea control these days but people are a bit confused about it. Natural flea control doesn’t indicate that something is not toxic, only that it is made from natural ingredients. Pyrethrins for instance, they are derived from a flower. 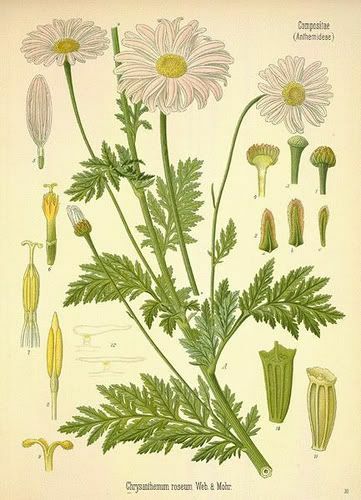 In particular the Chrysanthemum cinerariaefolium which is harvested around the world but particularly from Africa. It is estimated that Kenya produces as much as 70% of the world’s supply of pyrethrins. But even though the flea control product is made from a natural ingredient, an overdose can result in a toxic reaction in pets. Adverse reactions include drooling, lethargy, muscle tremors, vomiting, seizures and even death. One of the reasons it is important to do your research on flea control products and flea medications is because a lot of bad advice is floating around in cyberspace–and even in casual conversations. Always make sure to follow the directions on the packages of any flea medications you use. Also make sure you use the flea medication made specifically for the type of animal you have. Dog products should only be used on dogs and cat products should only be used on cats. Avoid breaking up a larger dose between animals since the wrong dosage could be toxic to you pet. This disturbing video shows a cat having a reaction to flea medication. Care has to be used when applying any flea control product or using any flea treatment on an animal or in the environment. One of the reasons I wrote Flea Control Secrets was because of increased issues and reactions. Take a few minutes to spend some time in the archives to learn more. Also, try exploring the natural flea control products listed on this website as safer, less toxic options.